A bar cart is the newest amenity at the 129 Newbury St. location of Oficio. Does a drink at work help productivity or hinder it? The death of the three-martini lunch in the ’70s seemed to answer that question. But an evolved business class is asking it again at Oficio, the office-sharing workspace where the newest member amenity is the bar cart. “Smoking or napping in the office might not happen like it did during the ‘Mad Men’ years, but a little whiskey to end the work day doesn’t hurt,” said Oficio cofounder Nima Yadollahpour, who installed the cart this summer at its 129 Newbury St. location. Atop the brass cart is a variety of spirits including Ketel One, Courvoisier, and Grey Goose, all available for members who want to entertain clients, celebrate deals, or simply need to unwind. “The intention isn’t to have a big bar. It’s just to have a drink,” said Yadollahpour, who took inspiration for the third-floor lounge from both fantasy and real life. A fan of “Mad Men,” he loved watching Don Draper and Roger Sterling knock a few back after signing a client or toasting a successful campaign. One of Oficio’s own clients, Jason Brown, chief development officer for the London-based hotel chain Yotel, suggested the bar-slash-lounge as a way to liven up the workspace. Brown oversees a global development team, including three members in Boston who are working on flagship Yotel projects such as the Seaport Yotel set to open in 2017. He says Balvenie single malt seems to be the preferred spirit. “It always seems to be empty when we go for it,” he said. The cart, picked up at Crate & Barrel, is stocked with more than a dozen bottles, several of which are presented on a silver tray. 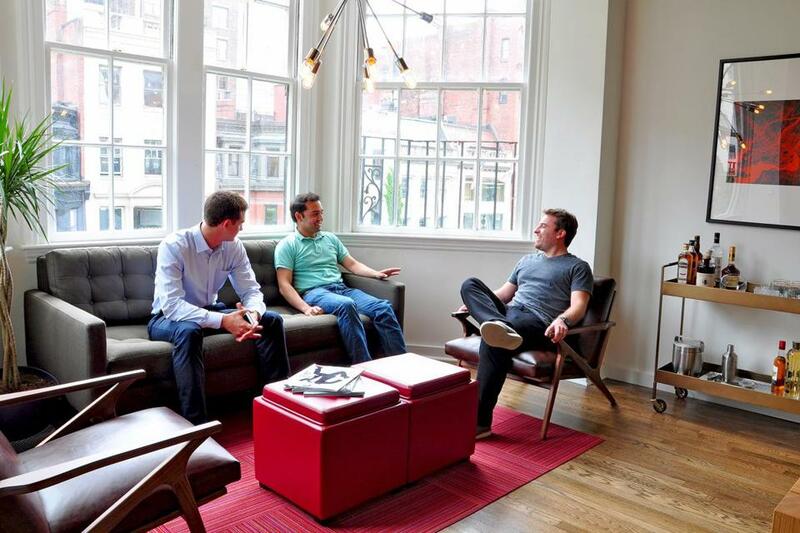 Brown described the setup as “sophisticated” — a bit different from the beer on tap at We Work, an office-sharing space in Fort Point. He’s already restocked twice, and he noted that Johnny Walker Black Label and the Barreled Boulevardier, a premixed Manhattan cocktail, have been immediate favorites. As a guy who drives to work, Yadollahpour hasn’t been able to take advantage of the cart. But he’s got other ideas.